Have you ever been trapped in such awkward position? Do you want to rip ISO file to MOV on your Mac computer for the purpose of either editing these wonderful videos in iMovie, Final Cut Pro, etc or playing movies on Apple iPhone, iPad, iPod? The best dvd ripper for Mac is in urgent demand to rip ISO to MOV videos on Mac OS X. 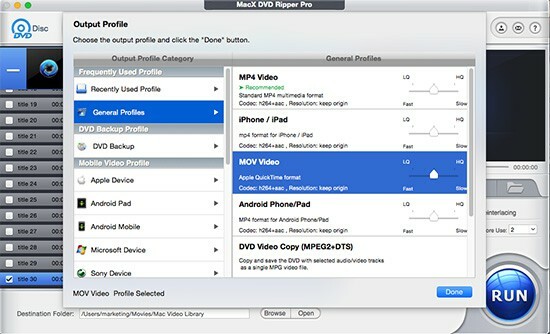 Never make a mountain of a molehill, here you can count on MacX DVD Ripper Pro, which helps you easily change ISO image to MOV format on your Mac computer for playback on iPhone, iPad, etc. Meanwhile, what sparkles your eyes when using this ISO to MOV ripper also attributes to its unique copy feature, so that you can copy DVD to hard drive with original video and audio quality in a few minutes thanks to this great Mac ISO ripper. Furthermore, you can also utilize this program to convert DVD/ISO to USB Type-C, Micro SDcard, hard drive, as well as other mobile devices with one click. Free download and run this Mac ISO to MOV ripper, click "DVD ISO" button to import the new DVD movies of ISO file on your Mac computer. Select the output format as you want, you can choose to MOV as you output format. You can even choose to convert ISO to MP4 for easier access to more devices like Samsung, HTC, MP4 player, iPhone, iPad, etc. What's more, the 300+ preset device profiles enable you to copy DVD and ISO image to the latest mainstream devices with one step. Step 3: Select Output Folder.. Step 4: Start ISO to MOV Conversion. "RUN" button to start ripping and compressing ISO image to MOV. You can view the whole progress and are able to cancel it at anytime. Besides copying ISO image to MOV on Mac, this Mac DVD ripper constantly upgrades to support to rip copy protected DVD on Mac, thus you would not miss any movies published by Disney, Warner, etc. It also allows you to rip DVD to AVI, MP4, FLV, iPhone, iPad, iPod, etc with high video/audio quality. Since you have converted ISO mage to MOV, you have an easier access to watch the videos on Mac computer. Actually, you are even allowed to watch the output MOV videos on iPhone iPad iPod only if you import them from Mac to iDevices. For this purpose, MacX MediaTrans do you a favor by transferring Mac videos to iPhone iPad in whatever formats, like MOV, MKV, AVI, FLV etc. Connect iPhone to Mac with a USB cable, Click "Video" icon, Click "Add Video" button to import the MOV videos, Press "Sync" button to finally move MKV to iPhone. The iPhone video manager will automatically convert the MKV videos to iPhone incompatible formats as you pressed down "Sync" button.